Preheat a burner to medium-high temperature. Put the flour and salt in a bowl. Add the eggs to the flour / salt mixture. Using a whisk (or spoon), blend in the eggs until the mixture is smooth. Set aside. Pour the milk into a Pyrex 2-cup measuring cup. Add butter. Heat butter and milk in the microwave until the butter melts (about 1 minute at 900 Watts). Remove from microwave and add rum. Pour milk mixture into the bowl, and stir again until the batter is smooth. Pour the batter back into the measuring cup. Butter the crêpe pan. Place pan on the stove, and remove when butter starts to melt. Pour a thin layer of batter (as thin as possible) on the crêpe pan, and spread evenly by tilting the pan. Return to the heat, and cook until the bottom starts to turn golden. Flip the crêpe using a spatula, and cook until the other side starts to turn golden. Remove crêpe and add topping (jam, jelly, sugar, maple syrup, etc.). Fold and serve. It’s best to eat the crêpes right away. If you don’t mind having dry edges, you can cool the crêpes, separate each crêpe with waxed paper, place them in a plastic bag and store them in the freezer. Reheat them in the microwave one at a time. 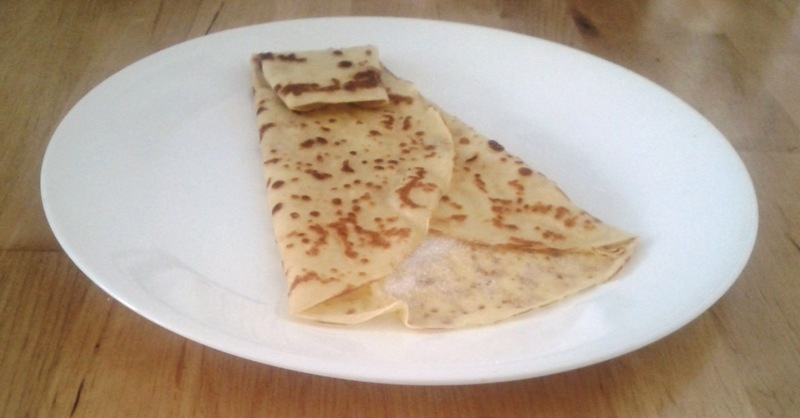 This entry was posted in Recipes and tagged crepes, French, recipe on 5 May 2013 by John Miller.